Happy Monday to one and all! Did you have good weekends? This smashing day out was one of the highlights of last year for me. I am so, so glad I registered with utmost haste, the second it opened; because all 450 spots on this year’s Run went in four minutes. FOUR minutes! Unbelievable. Of all the Vintage Mafia girls, only Jeni Yesterday and I got a spot! I absolutely can’t wait, after the fun of 2010’s Run. I even bought myself a bicycle especially, and it turned out to be one of my best vintage purchases ever! While the Tweed Run was its maiden voyage, I rode this All-Steel steed throughout the summer and autumn, getting fit, breathing fresh air and generally lifting my mood with every turn of the pedal. I absolutely fell in love with cycling and my lovely bike got lots of use. She even starred in the first ever Fleur dress photoshoot, and is going to take pride of place in an installation at the forthcoming Ideal Home Show… watch this space for more information on that! I did wimp out of cycling when it was really cold, and only brushed her off a few weeks ago for the first cycle of 2011. As you all know, I’m not a practical sort, and own no waterproof clothing, or even sensible shoes, so all-weather cycling is not for me. In fact, I went out on a damp day out last week and got absolutely covered in mud from head to toe! It was quite fun, actually, but I ruined my canvas trainers… ’twas worth it though. And it’s invaluable to get lots of cycling in before April 9th… I might have survived the Tweed Run last year (12 miles after having not cycled in a decade); but my posterior took several days to recover, I can tell you! If only I had a bit more disposable income, I would seriously consider purchasing a new steed in time for the Run. While it’s super to have a genuine vintage velocipede, it rattles, the chain and mudgards are loose, its rod brakes really are quite useless (form over function for sure); and the frame is a smidgeon too small for me, meaning instead of sitting bolt-upright, I am slightly bent over. Oh, I would love to get a new one, and have spent hours looking at pictures online. If money was no object, I would get myself a Pashley Britannia. The Britannia has all the best features of the classic Princess Sovereign – dynamo lights and five gears – without being cluttered by the rear skirt guard or rack. I have never found my skirt needed to be guarded against! And with a choice of red, white or blue, I’d be absolutely torn… if only I could afford its £625 price tag! A friend of mine is selling her barely-ridden, year-old basic Pashley Princess, but since I already have one black, ultra-heavy, three geared, lightless beast, there seems little point in buying another, even for the quite reasonable price she was asking. Sadly. Pashley are sponsoring the ‘Best Vintage Bicycle’ category in the Tweed Run… presumably this means the person with the best vintage bicycle also wins a brand new one! I am petitioning (not really) for them to change it to ‘Worst Vintage Wreck’. I’d be a clear winner since parts of my bike seem to be held together with little more than Blitz Spirit (so I didn’t even enter the category by the way)! I have, however, entered the ‘Most Dashing Dame’ one, and am busy planning my outfit… it won’t actually feature any tweed, but it will be heavy on vintage glamour! Slightly more affordable options for new steeds come from Bobbin Bicycles, a gorgeous shop located in Angel. I’ve been meaning to have a shufti there for ages, though I know I’d be tempted into buying lots of lovely accessories! Their Glorie Fairground is a slightly more affordable £425 (!) and has a very similar look. It’s a classic Dutch bike, made in Holland. 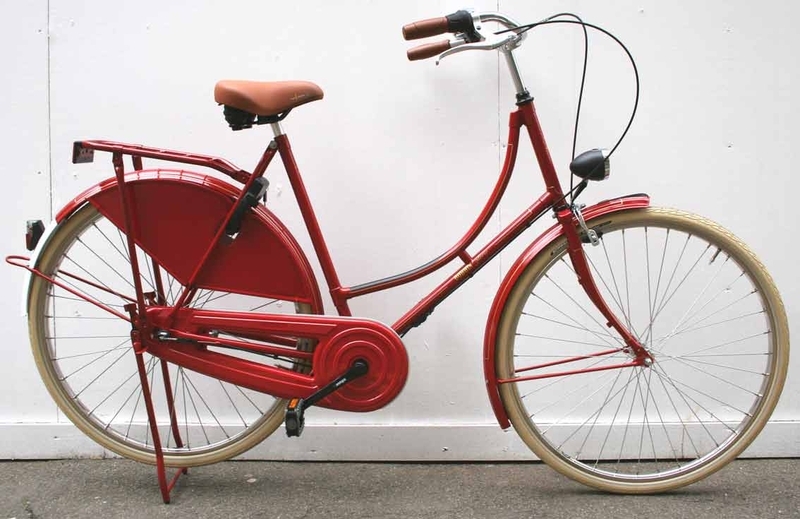 And last but not least, I might consider purchasing a Dutchie ladies’ bicycle. At £319 it’s half the price of the Pashley, lighter and has many of the same bells and whistles; but without the lovely leather saddle. And it only comes in black. But it’s still absolutely lovely! 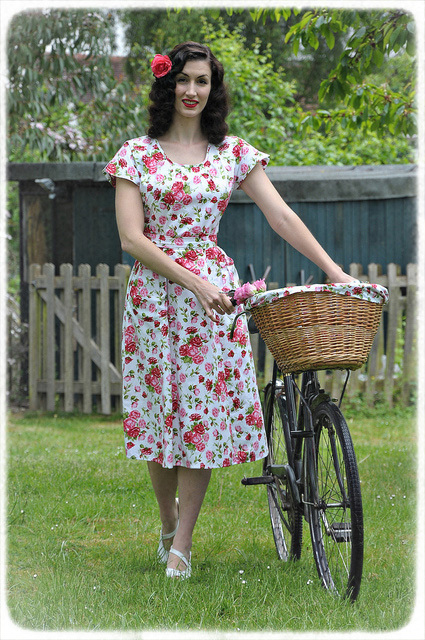 In short, I highly recommend cycling as a hobby and method of exercise to all the vintage ladies out there. 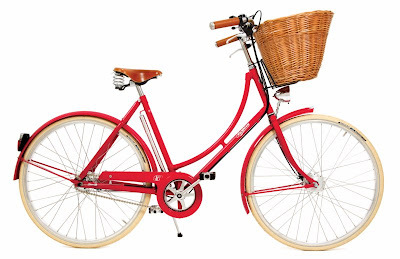 It’s so much fun, keeps you slim and you look damn cool (if a little clichéd… let’s be honest) when dressed in a gorgeous frock, riding an old-fashioned (or genuinely old), wicker-basketted bicycle around town. Just make sure if you go for ‘fitness’ rides rather than gentle pootles, that you wear something loose and washable. Sorry if that is too much info gals… but energetic cycling does make one rather hot! Back on the subject of tweed, I am jumping up and down with excitement, for I am off to Scotland for two days tomorrow. I am doing a tour of The Glenrothes whisky distillery, after which I shall be taken on such manly outdoor pursuits as clay pigeon shooting and off-road Land Rover driving. There will also be fine food… and lots of whisky, amazingly enough! I can’t wait to tell you all about it. I am concerned about the temperature in chilly Scotland, and am packing my beautifully thick Heyday tweed trousers, and will take my Puttin’ On The Ritz Spying For The Allies wool suit as well, for the evening meal. Which reminds me, I have some more modelling photos to post from the shoot I did for my aforementioned smashing sponsor, which include some snaps of the previously unseen Miss Atkins Blouse. I’ll leave you with these – some inspiration for the ladies lucky enough to get a spot on the Tweed Run! All taken by the talented Mark Bonito. I've been looking for a vintage-style bike that doesn't have the brown leather seat. so Dutchie looks perfect, thanks Fleur! 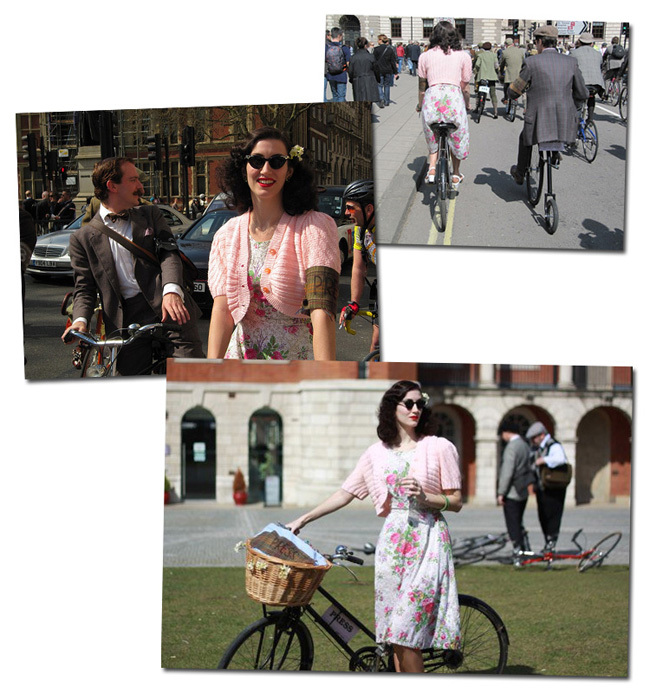 Wow, the tweed run sounds awesome, and these pictures are amazing! I went to the sample sale too, I was lucky enough to get there early, but I still had to queue for an hour! I've always liked the princess sovreign although it does sound as much like a grime act as a bike! I reckon it will have to be second hand all the way when I get mine though. This post is making me want to drag my bicycle off the porch and do some serious riding this year! Problem is that we live in the 'burbs, which means it can be a bit perilous competing with all the car traffic on the roads. So I've remained pretty timid about cycling around here, except at parks and designated cyclist trails! OH how I wish there was a tweed ride around here! My mister bought me the most amazing vintage inspired bicycle for Christmas and I am ITCHING to ride it. Alas, there is still ice and snow, so will not risk a wipe out! Sounds like you had a fantastic weekend!! Wonderful things like this never happen where I live. 🙁 I adore cycling, but as my bike is a hand me down men's bike (and not the vintage kind), I can't imagine that I'll be cycling round town in darling vintage anytime soon. On the upside, it was free and my dad and brother even fixed it up for me. Can't wait for pictures from the actual event! Lovely photos, great bike, wonderful blog! Looking forward to following. The tweed run sounds awesome! I wish we had things like that here in the US! You look beautiful as always! Oh bum it all. I am so not in the know about these things. Not that I would have made it in 4 mins. FOUR MINS?!?! crazy. I shall just have to make do with gawping at peoples pics. My 60's bike has a flat anyway – on account of it only being ridden once – home from where I bought it up the road. The pain of living 3 floors up. Re bikes – I *think* you can buy Pashleys from Evans – they do some sort of deal – like a pay weekly thingy-majig. *** Evans Cycles. Not Evans the clothes shop. Obviously. Fleur, that looks like so much fun!! And as always, you look gorgeous. I love the dress!!! So beautiful! You take wonderful photos!!! My goodness. If ever there was a reason I should NEVER have moved from London THIS is it. Oh how I would just love to see this– looking forward to living vicariously through your blogs about it! What a beautiful slice of paradise on the internet this blog is! Oh my, that is one seriously nice suit, I do envy you your height. Divine hat too. If I thought I could dig up enough cash from behind the sofa, I would have one in a moment! Weather in Scotland, at least here, is very spring like this week….so far. Enjoy. Your green suit is fabulous! I keep meaning to ask – you mention you ebay a lot of vintage clothes, what do you look for, do you have any recommended sellers to watch? Can you help a newbie to the 40's get kitted out!? I'll also be taking part in the Tweed Run 2011 with my Pashley Princess 🙂 This will be my 1st time and I'm so excited about it… can't wait! But if you want to get a more "authentic" look, I'd say go for the black Dutchie bike. Looks exactly like the original ones. My old (t)rusty bike's frame is vintage, guessing it's from the 1950s. Still does a great job, in ANY weather. Smiles from sunny South Africa! Don't underestimate the skirt guard! Once you've had your skirt get tangled up in the spokes, or even worse the braked you will understand. I've spent hours with my trusty stick of Vanish trying to get rid on bike grease from just this mishap. If you are really unlucky this accident can create a hole and it will always be your new and best dress. Such elegant and beautiful photos, you look simply stunning! To say that these photos are gorgeous will be an understatement!!! You look breathtaking, poised and out of this world. I love the poster for this year's Tweed Ride. Stunning! I believe there is a Tweed Ride held here in my town in America and I will definitely try to make it this year! Thanks for the inspiration. I have a Dawes "Duchess" bicycle and she is my pride & joy!! I have to say that I very much enjoyed your blog page thingy…..and feel absolutely devastated that I failed to make the Tweed run this year if such elegant participants as you were present….dashed shame (I was out in the Colonies earning a crust….yes terribly infra dig I realise…TRADE!…the very thought). By the way I have put a link onto my own blog suggesting that visitors pay your site some attention.